Today we’re proud to introduce one of the most recently requested features: multiple screens per account! This allows you to setup different devices showing different content, all managed under a single DAKboard account. Next time you login to your DAKboard account, you’ll land on a “Screens” page with a list of all your screens. Users on the Free plan will have access to the same predefined screen settings as before and users on the Premium plan will now have access to add additional custom screens. The current Premium plan allows for up to three custom screens per account. We’ll be adding more plans soon to accommodate additional screens! 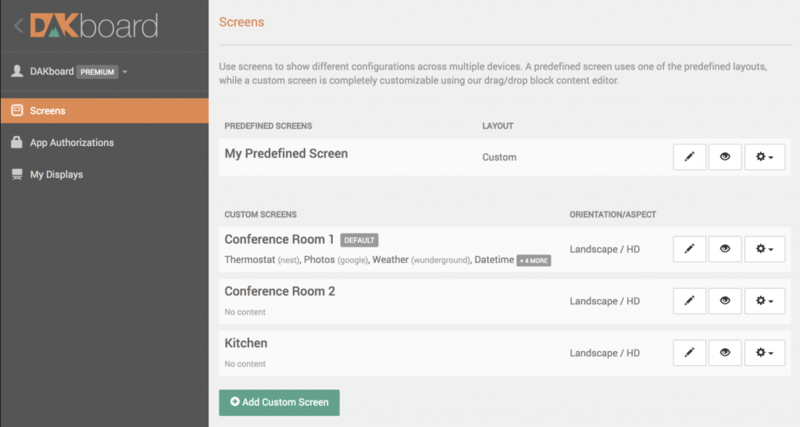 We’ve introduced a few additional concepts and tools to assist with the management of multiple screens. The first is the concept of a “default” screen. The default screen will be displayed when visiting https://dakboard.com/app, or when using the Private URL listed in your account settings. The default screen can be assigned to any screen in your account. Second is the addition of Private URLs for each screen. When editing a screen, under the “Settings & Defaults” tab, you’ll see a Private URL listed. This URL is unique to that specific screen, and can be used to display the screen on any device, regardless of what the default screen is set to. And as always, please feel free to contact us with any comments, problems or questions! Previous Previous post: Stock Quotes, External JSON Data, CPU Sale and More!